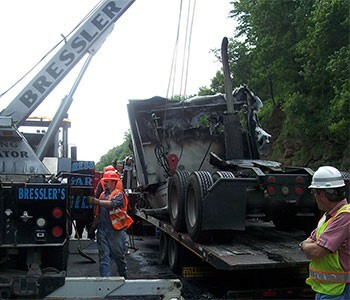 Bressler’s Garage owns one of the largest fleets of heavy duty towing equipment in central PA. Our trucks are specially equipped to tow anything from tractor trailers to construction equipment to custom well drilling rigs. Our wreckers will tow you anywhere you need to go. We specialize in all sizes of recoveries. 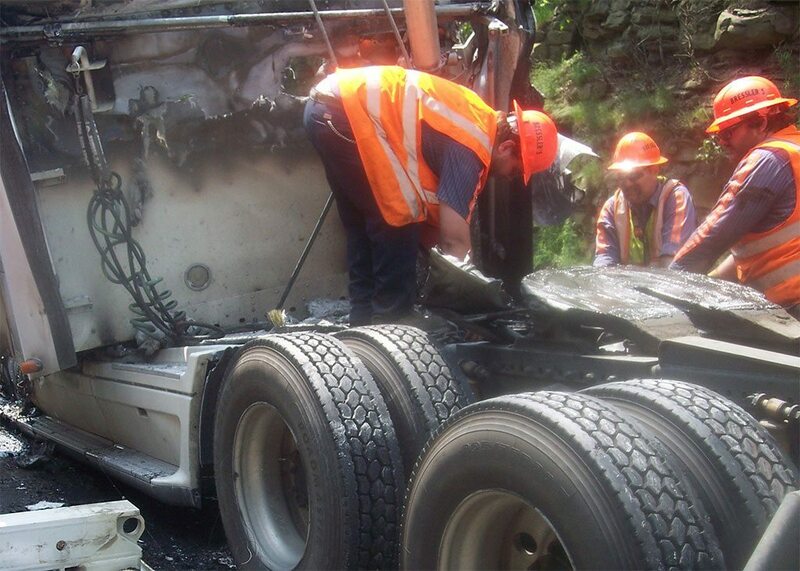 We have multiple 65-ton rotator recovery units, an air cushion recovery unit, and a uniquely customized incident response unit. 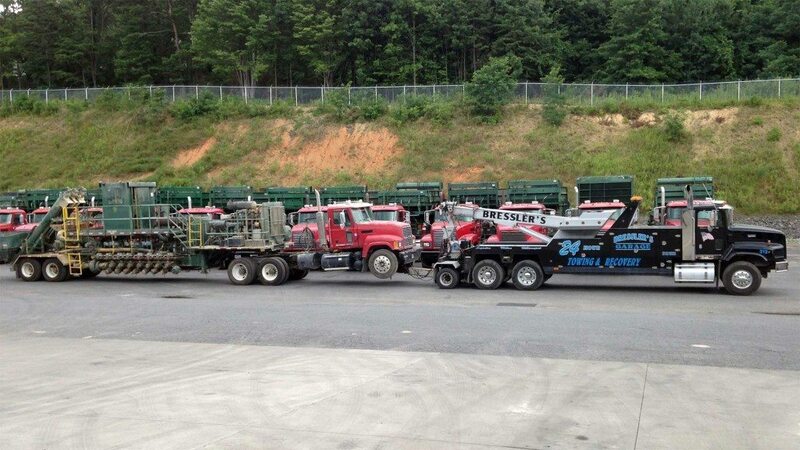 We can upright loaded tractor trailers, construction equipment, and specialized gas drilling haulers safely and efficiently, including in the more remote areas of central PA.
We operate a fleet of service trucks that will come to you. Our service technicians will unlock your vehicle, repair coolant leaks, and change tires, among other requests you may have. We’ll work with you to get your vehicle back in service as quickly and safely as possible. We staff our facilities with technicians fully capable of doing many in-shop repairs to your truck or trailer. We can replace your clutch, repair your broken driveshaft, patch your trailer roof, or weld your ICC bumper, as well as other repairs. 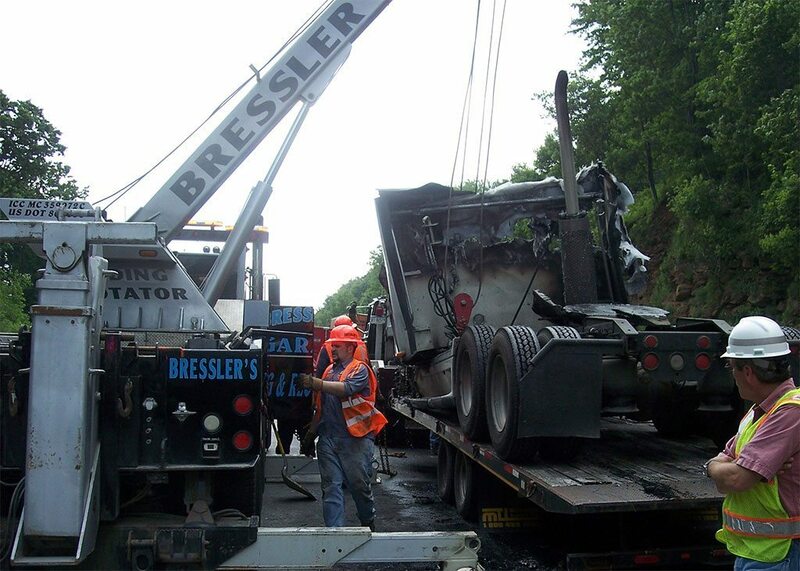 Bressler’s Garage is one of the largest, most experienced, and best equipped heavy duty towing and recovery companies in central PA. Our WreckMaster trained and certified staff, with a combined 100+ years of experience, safely and efficiently meets the stringent demands of the transportation industry 24 hours a day, 7 days a week, 365 days a year. Bressler’s Garage is always quick and responsive. Bressler’s Garage is the most professional and best equipped towing and recovery company we have worked with in central PA. They are the best at what they do, hands down. Bressler’s Garage is the biggest name and number on our call board. We are consistently very pleased with their response times and excellent service. Bressler’s Garage operates fully equipped and staffed terminals in Loganton, Milton, and Williamsport, PA. We are able to respond to and provide service in a large area of the state relatively quickly.